London during Christmas is just magical regardless whether we have a white Christmas in London not. If you are heading to London, you are in Luck as we talk everything Christmas in the city. Think Christmas things to do in London, from London Christmas markets, ice skating rinks, Winter Wonderland in Hyde Park, London Christmas lights, events and shows to check out and all the best places to visit in London at Christmas and many more perfect things to do in London in December. There are several activities for Christmas to get themselves involved in during this festive season, whether you are on the hunt for the perfect Christmas gift or just wishing to explore London’s winter wonderland. Below are some things to do in London during Christmas. Just like the Christmas lights in London, the ice rinks open up from November. If you are in London during Christmas holidays, this is a must try activity. You have a couple of choices to check out but if you are in London a longer you can check them all out. The London Christmas ice rinks start as early as mid-November all through the Christmas festivity and continue until well into the New Year. Below are the most popular ice rinks to check out in London. The Natural History Museum is perhaps the most magical place to go ice skating this Christmas. Skating sessions run all day and well into the evening, offering plenty of time for you to catch all the fun you would want this Christmas. The museum has these twinkling fairy lights and a magnificent Christmas tree that makes your skating experience a joyous one. To crown it up, there is a cozy museum café, overlooking the rink, where you can head on to after skating to warm up a cup or two of hot chocolate or mulled wine. Tickets: Adults £12.65 and Child £8.80. Family tickets are £39.60. Tower skate; ice skate at the Tower of London, right under this historical and iconic building. You not only have the castle as a backdrop but the city of London, Tower Bridge and Shard gleaming as you glide on the ice. Tickets: Adult £14.50, Studen and 12-15-year-olds £12.50, Child under 12 £10.50. Glide across the ice within the home historical home of Henry VII. The palace offers one of the most scenic skating experiences this festive season as the ice rink at Hampton Court Palace will transport you back to 1906 where the palace community was preparing for a Christmas to remember. Exploring Christmas markets in London has to be at the tops of things to do in London at Christmas. Below are some of the best markets to visit in London during Christmas. You can not only buy gifts and indulge in festive delights. Under the watchful eye of the London Eye, you can explore the markets around Southbank. There are rides and carol singing to keep you well entertained while you enjoy a never-ending selection of German snacks, warm beverages and various homemade crafts. This Christmas market stays open for a very short period of time; from the first day of December until Christmas Eve. With over 150 stalls where you can buy festive goodies, original art pieces, fun stocking fillers, fashion gifts and many more, the dazzling Greenwich market is one market you want to visit. Do well to also visit Father Christmas at the magical Santa’s Grotto. 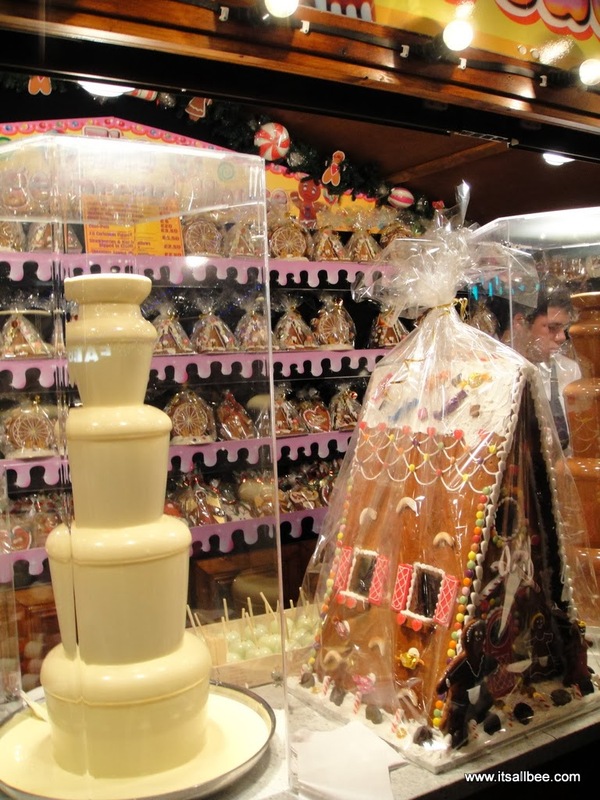 This is known as the biggest and most famous Christmas market in London and it boasts of numerous stalls from which you can buy festive foods and presents for your loved ones. There are also other attractions like skating rinks, a magical ice kingdom, a giant Ferris Wheel and a couple of other things. Entry is free. If you are looking for classic Christmas treats, this is just the place to go. There are dozens of wooden chalets selling homemade jewelries, holiday crafts, mulled wine and cider, bratwurst, roasted nuts, and crepes even as light music plays from the background. An incredible place to pick out the best last minute Christmas gifts. Once the home of local government, London Marriott County Hall is a luxurious and elegantly styled hotel in the heart of the capital. Steeped in heritage and situated on the iconic Southbank of the River Thames, this is an immersive experience for those who love London. Delight in a classic British tradition with an afternoon tea, filled with a selection of delicious treats. Enjoy delicate finger sandwiches, fresh scones with jam and cream, homemade cakes, and a choice of teas. Sit back and admire stunning views of the city’s landmarks, including the famous Westminster Bridge and Big Ben. Toast the occasion in style with bottomless gin and tonic refills. 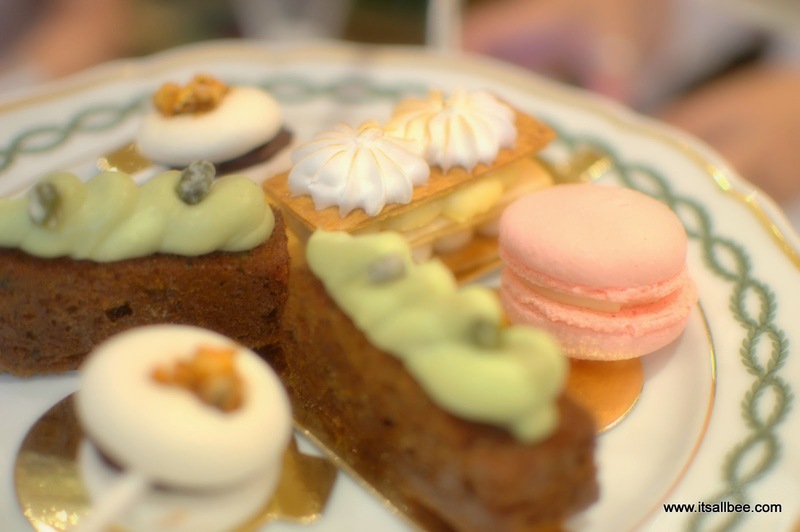 Considered ‘one of the most wonderful settings in which to take afternoon tea in London’ by the Tea Guild and the winner of a Commended Award of Excellence at the Afternoon Tea Awards 2018. Located near the Wonderland of Hyde Park, you can go to the Park Lane Hotel for some fine teas that you can take while enjoying some gingerbread macaroons, some Christmas pudding scone, chocolate and Bailey’s lollipops, as well as some turkey finger sandwiches. Head to the heart of Mayfair and take a pew in the Palm Court’s art deco dining room for a Bird Cage themed afternoon tea spread. The View From The Shard towers over London and with an impressive 95 storeys, it’s the tallest building in the EU. This experience combines the truly breathtaking view from the top of this stylish building with a traditionally English afternoon tea. Upon arrival at The View From The Shard, be transported from street level a whopping 800 feet skyward to survey the 360 degree view that spans an incredible 40 miles over the capital city. Enjoy a spread of delicious finger sandwiches, delicate cakes and pastries, raisin scones with clotted cream and jam and a pot of speciality tea. The perfect end to a wonderful afternoon. Christmas lights can be a wonder to behold. So walk down by either of these places and be totally mesmerized by the beauty you behold. Take a slow walk along the iconic mile-long shopping Oxford Street and prepare to be dazzled by the 750,000 bright bulbs and glittering baubles as well as the falling snowflakes. This is the most spectacular Christmas lights display in all of London. Also, this festive season, you would need to head out to Harrods in Knightsbridge and see the wonders of Christmas in the spectacular display of 11,000 bulbs and twinkling along Harrods’ shop window hedges. The Christmas lights display at Leadenhall market is usually both delightful and magical to behold. You should take a walk along this covered market and see for yourself what a celestial Christmas illumination looks like. Both of these streets are famous for having a variety of international stores where you can shop for excellent gifts while having a great Christmas experience from all the wonderful display of Christmas lights. On Knightsbridge, you can go shopping on either Harrods with over 300 departments or Harvey Nichols for a wonderful Christmas shopping experience. On Knightsbridge, you can do your fashion shopping as well shop for homewares and presents. Head down to this 14 pedestrianized street for an awesome Christmas shopping while their famous Christmas lights make the whole experience an unforgettable one. The shops, Westfield London and Westfield Stratford City are two shops you want to go to when you are looking at shopping for everything you need, for whoever, in just one move. Christmas in London is not complete until you have visited a wonderland. At the wonderland, you should get ready to have a great time ice skating, or having those fun-packed rides or even visiting markets. Hyde Park promises the best wonderland experience this Christmas season. Looking those cozy things to do in London in December when the days are cold and just want to snuggle up? Well its go to be this place then. At Coppa Club, there are those giant spectacular Igloos that become very popular during the Christmas season. The Igloos have very comfortable chairs and blanket to help you sit back, relax and take in a wonderful view of Tower Bridge. You don’t have to worry about the cold, as the Igloos have built-in touch-censored system that you can regulate however you want. Also, Coppa club has an attractive menu with several foods and drinks that are quite affordable. Make up your mind to visit Coppa’ Igloos this Christmas with your loved ones and make memories that will last for a lifetime. Oh boy is that a comprehensive post!!! Love it. I live in London so this will come in really handy. Awesome! Hopefully I have showcased a couple of new Christmas activities in London to add to your list. Oh my goodness those igloos. And how come the thought of Christmas afternoon tea never crossed my mind? I love everything about that! I still haven’t been to London, but it seems like the best time for me would be now (I also love the cold, so that’s no problem for me!). Oh man, then your next trip in 2019 surely has to be a trip to London 😀 …or maybe make Christmas 2019 one to celebrate in London. Great post! I lived in London for a number of years and have found the best Christmas atmosphere there, better than anywhere I have lived since. Unfortunately the Coppa Club wasn’t open when I was there but it looks incredible! Yes, there so many cool little places opening up every year. Christmas in London gets better every year. After reading your post I’d love to go to London during Christmas time. It looks so lovely! I especially like the idea of ice skating, even though I suspect it would be quite crowded. Actually the skating rinks in London are not that crowded. Yes they can be busy but as we have quite a few the crowds seems to spread out evenly. I love London and this just seems amazing!! Hopefully, I’ll get to see it one year. Will keep your London Christmas guide in mind for that! Yes, London at Christmas is just beautiful. Definitely visit during Christmas if you can. This is an awesome list! I have always wanted to visit London at Christmas! I especially want to do the winter wonderland and igloos! Great list! Thanks. You should definitely visit London at Christmas time. Its just so festive and the atmosphere is just amazing. I have been planning my trip to London for a while now and hunting for unusual things to do in London at Christmas. This is so cool as you have covered so many activities that I hadn’t even considered to explore. Thanks so much. I no longer have to work so hard trying to figure out what to do in London during Christmas holidays. Thats great to hear, I am always glad to hear when I make my reader’s lives a little easier. I hope you have an amazing time in London. Merry Christmas! We are going to be in London during Christmas. I was wondering if you can recommend things to do in London in Christmas day? Are there lots of places still open? Hi Kendra, over the years there are more and more places you will find that are still open on Christmas day. There are still pubs and restaurants that open on Christmas day in London. There are shops that are still open but these are mainly 7-11 shops where you will find Asia that don’t celebrate Christmas. Also bear in mind that there are no buses or trains running. So make sure you are staying somewhere with easy access to tourist attractions so you can still explore at leisure without worrying about how to get back to your accommodation over Christmas. We are visiting London with family. I am in Love with your blog as you have helped me plan so many trips! I have now been on the hunt for family things to do in London at Christmas. This is such a cool list you have put together I really cannot wait to visit the festive period in London with my kids. Hey there. I am super excited for you too. Have an amazing time in London with family and Merry Christmas. These are some awesome suggestions! This December I am planning to visit London and I am so glad that I found your post. you described everything like what to do during Christmas and places to visit during the festive period. Thanks for sharing such an informative post. I am moving to London next summer and super excited to spend Christmas in London and check out many of the alternative things to do in London at Christmas. Such a cool list you have there. This is such a cool list. I have been to London a couple of times but never during Christmas. So many of the best things to do in London at Christmas, I seriously need to visit Christmas 2019. Great post, Bianca! I absolutely love London at Christmas time – especially all the outdoor ice rinks and the markets that pop up everywhere. Not only can you find some real hidden gems at London Christmas markets, you can also buy some of the most delicious food (and for a good price, too). I like that you’ve included a whole range of options in your guide – things to suit students, families, tourists and everyone. This list makes me even more excited for my visit to London. I am just lucky enough that I planned my trip during Christmas, London seems totally different during the season. Glad you like it. Christmas is such an exciting period. Hope you enjoy your trip.